Princess Eugenie has married her long-term boyfriend Jack Brooksbank at St George's Chapel in Windsor Castle. 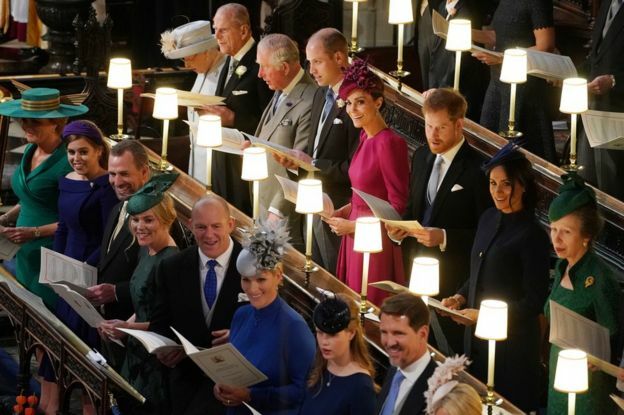 The ninth in line to the throne was watched by her grandmother, the Queen, and Prince Philip, along with other members of her family. 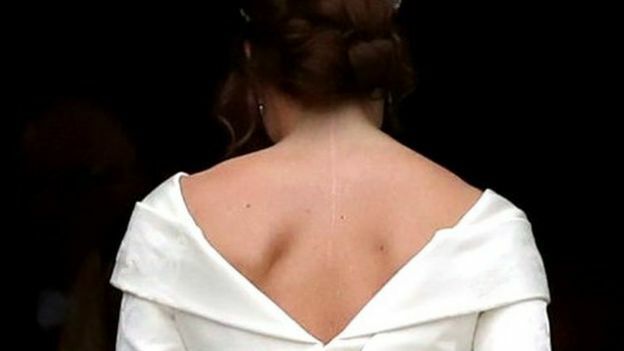 Among 850 guests were celebrities such as Cara Delevingne and Robbie Williams, while 1,200 people chosen by ballot followed proceedings from the grounds. They cheered as the newlyweds kissed twice on the chapel steps. Guests laid out picnic blankets and quaffed champagne but had umbrellas at the ready and often had to fix their fascinators in the blustery conditions. 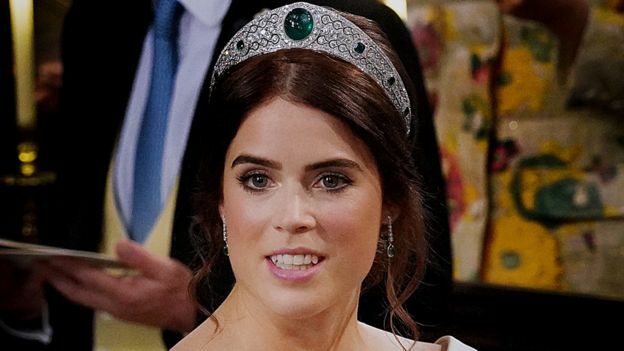 She wore the Queen's Greville Emerald Kokoshnik Tiara, made by Boucheron in 1919, featuring brilliant and rose-cut diamonds, pave set in platinum, with six emeralds on either side. 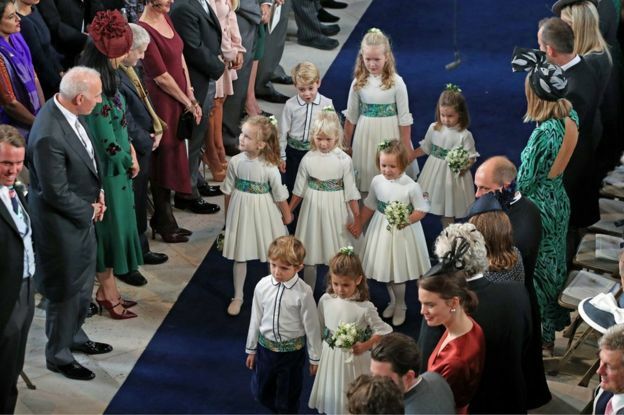 The Duke and Duchess of Cambridge's children, Prince George and Princess Charlotte, acted as pageboy and bridesmaid. Charlotte waved enthusiastically at the crowds as they approached the chapel, through negotiating the steps in the high winds proved tricky. Charlotte struggled to keep balance, while pageboy Louis de Givenchy - son of family friends - took a tumble. Some of the youngsters were seen giggling and joking before walking down the aisle, appearing to imitate the royal trumpeters. However, George held his hand over his ear as the musicians heralded Eugenie's arrival. Eugenie's sister, Princess Beatrice, was maid of honor. Mr Brooksbank chose his brother, Thomas, as best man. Numerous celebrities braved the weather, including singer Robbie Williams and his fellow X Factor judge Ayda Field, whose daughter Theodora, six, was a bridesmaid. Singer Ellie Goulding, comedians Stephen Fry and Jack Whitehall and supermodels Kate Moss and Naomi Campbell were in the congregation. Cara Delevingne grabbed the attention of social media commentators with a dashing top hat and tails combination. Don't like the Royal Family if I'm honest. The outfits are always the best parts of Royal Events. The funky hats, and ridiculous dresses, etc etc.